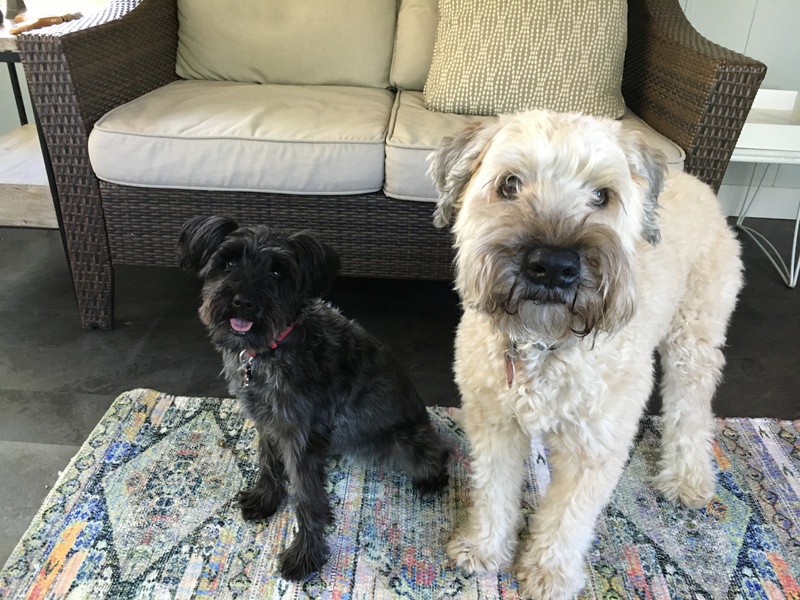 Dexter is a three-year-old Schnoodle who was recently adopted into an Omaha home with Rocky, a thirteen-year-old Wheaten Terrier. The dog’s guardians set up a dog behavior training session with me to stop both dogs from charging the door when guests arrive and get Dexter to stop nipping people who touch his feet or try to wipe his eyes. Both dogs were excited to see me, but Dexter was more animated and active due to his age. I did notice that the guardian’s technique to control the dogs was actually contributing to their excitement. You can catch the dog behavior tip I shared with her in the last part of the video below. One of the activities that triggered the excited dog behavior was when people knocked on the door. This is a common dog behavior problem many people face. Part of the reason the dogs get excited when people arrive is their humans pet them when they are excited when they return home. I recommended the dog guardians start waiting for the dogs to settle down before petting them in the future. Another reason the dogs acted this way at the door was a lack of rules and boundaries. Dogs need humans to tell them what limits are in place otherwise they get the impression they are our equals and if a dog sees you this way, then they often try to assume a leadership role. To dogs, security is something a leader does. After suggesting some rules and boundaries and ways to enforce them, I had one of the guardians head outside so I could show them how to claim the area around the door before opening it. Mastering this exercise will give the humans the opportunity to train the dogs how they want them to behave at the door. But this will only work if the humans also assume the leadership role in the dogs eyes by constantly enforcing the new rules I suggested earlier in the session. Another problem Dexter had was biting people who tried to touch his feet or wipe the boogers out of his eyes. I used a combination of counterconditioning and desensitization to stop this dog behavior issue. By the end of the session, both dogs were calmer, looking to their humans for guidance and leadership, staying behind an invisible boundary ten feet from the door when people knocked and Dexter was allowing to touch his paws and wipe sleep out of his eyes. We finished the session by filming a Roadmap to success video.